I made cookies tonight. I got the recipe from this wonderful blog. They turned out perfect. Light and YUMmy! I rolled a portion of them in cinnamon just for an extra zip. I am looking forward to having them with coffee tomorrow! This is a shortbread inspired by the version published in The Castle Cookbook by Marjorie Collard and Ann Marie Lopez. The end result is a perfectly light and buttery shortbread cookie with just the right amount of sweetness. Preheat oven to 350F degrees. Sift the flour, baking powder, and salt into a medium bowl and set aside. In a mixing bowl beat the butter until light and fluffy. Add the powdered sugar and beat again, scraping down the sides of the mixing bowl once or twice as you are mixing. Beat in the vanilla extract. If you have a vanilla bean slit it open along its entire length, scrape out the vanilla bean paste from the interior of the bean, and add this to the mixer as well. Add the flour mixture in two additions. Stir until everything comes together into a thick dough. Turn the dough out onto a counter top and divide into two pieces, there is quite a bit of dough, so cutting it into two pieces just makes it easier to roll out later on. Press each piece of dough out into a flat patty an inch thick. Wrap each piece in plastic and chill completely in the refrigerator - about thirty minutes. When the dough is chilled, use a rolling pin to roll the dough out 1/4-1/2-inch thick. Cut the dough into desired shapes using cookie cutters or a knife and place on a parchment (or Silpat) lined baking sheet. Bake for 7 to 10 minutes, or until the bottoms of the cookies are barely golden. 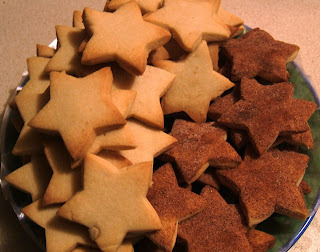 Makes 3 or 4 dozen tiny cookies - more or less depending on the size of your cutters.